Words cannot express the sorrow experienced and the current needs of the people in this geographic location following the devestating earthquake and tsunami. Our thoughts and prayers go out to everyone affected by this disaster. When I started this blog in June of 2003 it started as an outlet and way to share thoughts, ideas, tips/tricks, personal stories and more related to the AEC industry. At that time it was the only cad related blog; since then it has been great to see the growth of so many who have since joined the blogging world. If there are any others who may have started in the past week let me know if I have not found you yet. Seasons greetings from the will render for food family to you and your loved ones. The trip through St. Louis was a lot of fun and gave a great opportunity to meet many new people and discuss cad, visualization and of course ADT. I also want to thank Melanie Stone for meeting me for dinner at Imo's (I got to try my first St. Louis style pizza). If you have not had the chance to meet Melanie in person yet, here is a picture. We had a great discussion on cad; past, present and future, as well as some great discussion about AUGI and CAD User Groups, life and more. 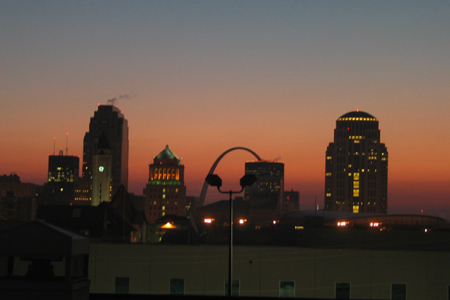 If you are in the St. Louis area you should try to attend the next Gateway Autodesk Users Group meeting on January 11, 2005. I have some more business to take care of here in January and plan to venture out further when I return. Any suggestions of places to visit/see in the evenings let me know. Looking forward to seeing more postings from you Tracy and keep up the great work! While traveling through many different parts of the country I typically try to have dinner with a few cad and/or visualization folks to chat (geek out) when time permits. I will be in the St. Louis area for a few days; if you are interested in getting together for dinner on 12/16 drop me an e-mail. These are always very informal sessions, lots of fun and offer a chance to meet other users in your area with related interests. Also for those that are not aware there is a local users group in this area too, but no meetings planned during this timeframe. While not quite up to the level as Joel's office, we have been enjoying the new outdoor scenery and interior decor compared to the previous location. For anyone local that would like to see the space there is an open house tomorrow afternoon, feel free to come by and say hello. I am unable to make it to the open house but there will be plenty of other great folks to meet and of course great food, wine and even some door prizes and other goodies. I will be posting a few pictures of the new layout later in the week for anyone interested. I have been anxiously waiting to go see The Incredibles. Royal and I headed out to the theater on Saturday to watch and it was incredible! Good storyline and a great animation. Afterwards over a good pint of ale we talked about the different items we liked and both agreed that in many places the blurring of the lines between photorealistic cinematography and "cartoon" style was done so well that you hardly even noticed it was an animation. If you are a fan of animation this is one you should not miss. I was reading Manton's blog recently and he mentioned that ASIFA-Hollywood members recently received the Incredibles DVD screener, while not currently a member of the I will have to wait for this to arrive on DVD with the rest of the world. In the meantime I may try to catch this again in the theater. Next meeting: December 16, 2004, at Hanbury Evans Wright Vlattas + Company (HEWV) Architectural Firm's "Knowledge Cafe", located at 120 Atlantic Street, in Norfolk, Va. between Waterside and MacArthur Mall. 7:00-7:30pm - Topic #1 - Nick McCully of Rouse-Sirine Associates will cover a broad spectrum of tips and tricks including: Properties Dialog Box (Filter command), Express Tools (Nick's Favorites), Paper Space Tricks, Converting clients drawings to your format, and Text Set Up & Tricks. Learn to work faster, not harder. 7:45-8:30pm - Topic #2 - "How NOT to model in AutoCAD/ADT" Through the last few years Mike Taylor has been using AutoCAD/ADT to model buildings and other geometry using a variety of methods. This presentation will cover the many lessons in modeling that Mike has learned the hard way over the years. For beginners and advanced users; this topic will have a lot of great tips and lessons to help you avoid common mistakes and make your modeling life even easier. Mark your calendar! After this meeting, the next one will be on Thursday, January 20 2005. As always, free food and prizes. Last but not least, thanks to everyone who supports and attends our meetings. The EVAUG would not continue to grow in its current direction without your active participation. During AU Rob Finch introduced me to a set of videos/animation "Red vs. Blue" that is reminiscent of Mystery Science Theatre 3000. Basically a group of people are using the game Halo (and now Halo 2) to shoot a movie within a game. Several of them interact with each other and one guy's view is essentially the camera angle. In their words: "We use four Xboxes, four copies of Halo and a PC with a Canopus DV Storm capture card and a bunch of Adobe editing software. Run the video from one of the Xboxes into the capture card and use that as the "camera", the other XBoxes are used for the characters and are run by our puppeteers." There is some pretty funny stuff (in some cases juvenile humor) they say/do. Download a few videos to watch or to make this even better you should go back and start at the beginning or purchase the DVD's for each season here. 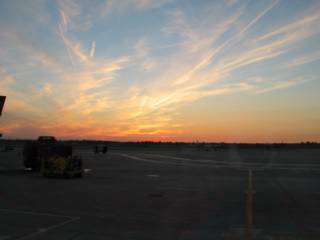 Robin Capper has posted his AU photos (from San Francisco to Vegas) here. I got the chance to meet and have dinner with Robin (and Jan) during AU after we bumped into each other at a Autodesk Usability Study. Thanks again Robin for dinner and the great New Zealand pen. Shortcut keys... simple, easy, effective and something you should learn. Most every windows/mac/unix software has keyboard shortcuts to enable you to work faster in your daily computing life. If you are not using them you you may be overlooking one of the biggest time savers. Over the years I have learned the ones in AutoCAD/ADT and know a good majority of the ones in VIZ/MAX to leverage the software effectively. I run across users continually who are unaware of the numerous keyboard shortcuts there are. For example did you know that if you have multiple drawings open in AutoCAD you can use the Ctrl + Tab key combo to cycle through the open drawings (think a continuous loop) and if you go past the drawing you want you can always reverse the loop by using the Ctrl + Shift + Tab key combo. Want a few more standard window's shortcut key combos? 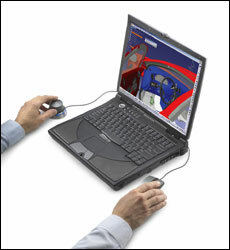 Alt + Middle Wheel Mouse Button is Arc Rotate, no more need to use the icon from the toolbar. This even works in Viz Render! There are plenty more useful shortcut keys for each of these programs. To learn more you should check the help file and/or the accompanying quick reference card that most of these programs ship with. It has been nice to see the thoughts and experiences of so many individuals come to life through blogs over the past two years. A few weeks ago Shann, Lee and myself set up feedburner accounts to spread our blogging experiences with a larger audience. For those who use both .pdf and .dwf format's to share/archive data one of the the first things you may notice is that Acrobat has the ability to merge other .pdf files into your current multi-page document. For those who wish to merge .dwf files together into a multi-page document you can easily accomplish this using DWF Composer. This is a tip I recently learned from Shaan. 1. Open a .dwf document using DWF Composer. 2. Using Windows Explorer browse to your .dwf file. 3. Drag the .dwf file you wish to merge from Explorer to the DWF Composer Navigator pane. 4. Save your file. Done! For those who do not have DWF Composer you can also accomplish this task as described by Shaan here. About a month ago I got access to using a CadMan but had major issues with the downloaded drivers and Max 7 that prevented me from using it. During AU I saw the 3dconnexion booth and stopped by for a chat to see if they could help. Turned out to be some kind of an issue with the driver and is not present on the new cd's with the products. While there I also got a chance to play with the Space Traveler and fell in techno love (ok it was really techno lust). This has been great fun and already productive in the first few days of my return from AU. The Space Traveler also works with many other programs, but I found it best to work with VIZ/MAX so far. For those wondering the cool blue lights around the edges are also customizable buttons (8 in total). 1. Photoshop - The OTB settings seem strange at first as the navigation is the opposite of the way I think/work. 2. Architectural Desktop - The OTB settings for this are actually based on AutoCAD. While this may not make a difference to most users I found the settings very limiting and clunky, not at all the way it behaved for Viz/Max. 3. Revit - While the drivers do not mention about Revit I thought I would give it a try, no dice. The OTB settings are just not there. 4. Inventor - Okay I admit I am not a regular Inventor user but I have a friend who is and we tested this out on his system and he liked the way it performed. The price is a bit steep but if you work with VIZ/Max on a regular basis you should give the Space Traveler a trial run. See the results for Day 1 here, thanks to Ted Boardman for judging the entries for this day. See the results for Day 2 here, thanks to Chris Bullen for judging the entries for this day. See the results for Day 3 here, thanks to Jim Smell and Paul Aubin for judging the entries for this day. Many thanks to Steven Papke from the Vizdepot for co-sponsoring the challenge and prizes that were given. Autodesk University is now officially over as the final day of classes/events involved a 3.5 hour session/lab for most everyone. For my last class I took one called "Autodesk VIZ Lighting: Get A Grip" by the master himself. If you work with visualization in either Viz or Max you owe it to yourself to take a class at somepoint with Ted. As usual this class ventured into many areas and had Ted sharing some techniques as well as having some great audience participation. The two main areas touched on were Exteriors and Interiors. The first was done using the scanline renderer and the second using and demystifying radiosity for those who may not have had a firm grasp on the subject. One other thought that I thought would be great to share from the Max 7 class yesterday involved the use of changing the large amount of used lights in an exterior scene to using only two mental lights, this made for the same final result in about the same time with a lot less lights to control. There was so much great content and insight offered by Ted that in addition to the handout I had multiple pages of additional notes/thoughts based on the discussions. This was another great AU and it looks like I will be seeing you next year at AU in Orlando, FL. Early this a.m. I attended a Max 7 class called Design Visualization for the Advanced User. This dealt with numerous great tools inside of Viz/Max that will help make your life much easier and also shared a small bit of Mental Ray as well as some Combustion. I have not used Combustion yet, but this looks incredibly powerful! After this great start to the morning this had me in several different locations throughout the MGM. Along the journey I also learned that the Segways have different magnetic keys and each is pre-programmed to do different things. For those who like speed, the red key is what you want. =) Stopping by the rendering challenge was great as I ran into numerous people along they way including Jim and Stefan from the Vizdepot and numerous others. It was nice to see the renderings being done using Viz and Viz Render by so many people. I will try to get the winners uploaded to the Vizdepot tomorrow. One more half day of AU then it's over... Not to fret as there is always next year and the classes and events just continue to get better and better. The sessions here today were great and ranged in many directions for myself. One that really stuck out in the morning was from Chris Bullen and was called "Visualization Voodoo". Two items that really stood out dealt with sub-object animation (in Viz, yes that's right) these included the animated elevator (using a plane and a greyscale .avi file in the Material Displacement slot and a flying bird (spider and tree too!). Basically the bird's wings were animateable in Viz by using a combination of the Patch Deform and Path Deform modifiers. These little items make a world of difference in believability in rendered animations. Chris also showed how easy this is to do in Max without the workarounds mentioned above. Simply put, this was great stuff. As luck would have it Chris was also the judge of the rendering contest held today too. Lunch was an awesome feast and we got the chance to meet and chat with numerous people. Unfortunately I missed Jim, but did manage to get in touch with Rob and numerous others to chat throughout the day. The afternoon was spent with numerous BIM classes and each offered some great ideas/solutions. The evening was spent with a few parties on-site of the MGM and was great fun getting to meet new people and see a host of other old friend and those we have exchanged converstations through e-mail and in the NG's. That is a quick recap and Thursday is filling up quite quickly as well. Well the day has just ended for me and now trying to wind down. This afternoon I had hoped to attend this event, but had my curiosity peaked by a Max 7 session, though I did manage to run through to say hello to Shaan along the way to. The Max presentation did not have very much description on what to expect and I was pleasantly surprised by the presentation from Rich and Mike Burmann from Paul Steelman. To start this off they simply started playing an animation with music that was top notch and got everyones attention from the get go. Rich shared his background and his role in creating and helping to grow the 3D visualization department for this company. In addition to sharing some background on the type of work they do and the tight turnaround time (1.5 weeks) for some of the best animation work I have seen coming from the Architectural Industry but also shared much more about the inner workings and what it takes for them to get this accomplished with everyone involved in the process. Along the way Rich and Mike shared some highly useful tips for keeping their renderings time down to meet these deadlines and shared several tips from their running checklist that everyone on their design team uses. There was quite a few items that I have not heard of before that I hope to share with you as I implement these into my own rendering pipeline. After this session it was off to take the ADT Certification Exam. This was not too difficult, but I ran into 4 questions that were incorrect according to the question and had to prove this to the gentleman overseeing the exam and they then agreed. One thing to keep in mind for those who may be considering taking this read the questions carefully as the semantics can be tricky in a few areas. All in all it was a good exam focusing in multiple areas. If anyone would like I would be happy to post more about this just let me know. After finishing and passing this it was off to the Avatech/Vizdepot Autodesk University Rendering Challenge. Upon arriving there were people lined up and rendering away. It was refreshing to see and chat with so many new faces from all over the world; Japan, South Africa, just to name a few. Todays winners will be announced and their work will be displayed on the Plasma screen at the Avatech booth (#800). Today is the opening day for AU (though yesterday held a few events for ADT and ATC members) that offered some great information. Well in the past few days I have seen several friends around town and on the MGM floors. Ran into a few Kiwi's along the way (Mike Burke and Robin Capper) as well as many others from here in the states. As mentioned today is the opening day for general AU attendees. This morning I had the pleasure of taking a 3.5 hour class from the rendering master himself; Ted Boardman. Shortly I will be attending an industry session that should be quite interesting then off to finally take the ADT certification exam. I will be uploading pictures this evening for those interested. For those already here be sure to check out the "Avatech/Vizdepot Rendering Challenge" at booth 800. 2. Lightweight jacket/sweater. The environment at AU is great and temperature usually warm while walking around. This is not when you need the sweater/jacket, this is needed when you are attending classes as they tend to run cool. Better to be prepared than frozen stiff. 3. Remember those hard choices you made choosing which classes you wanted to attend? Some classes may not be what you wanted/expected them to be and most instructors let you know at the very beginning what they will and will not be covering. Make sure to have a list of other backup classes you would like to attend and their locations in the building should your class not turn out to be what you expected. It never hurts to have more than 1 backup either. 4. Wi-Fi and anti-virus. - If you are bringing your own notebook to keep in touch and take advantage of the free wi-fi at the convention center make sure to update your anti-virus before arriving. Last year someone on an unsecured machined infected a great many unsuspecting people and closed the wi-fi service down for a day. There is also internet access via machines within the main hall. 5. Keep yourself well hydrated. This tip should begin the moment you read this, seriously. 6. When you arrive Vegas is a very enticing place to be and you are going to be around 4,000 other people who love cad as much as you do; pace yourself. There is nothing worse than letting your first night ruin the rest of your trip and learning. The next posting will be in route to AU. We are staying at the MGM Grand for those we were unable to get in touch with earlier or you can call my mobile directly. We are looking forward to seeing you there and for those that could not make it there will be plenty of blogging going on from the event. No promises yet but Steve and I are working on some live video feeds from AU too! I have not had the opportunity to catch the CG film "The Incredibles", but hope to soon. I was reading this recently and according to an article in the latest issue of CGW, Pixar has been using 3ds max and Brazil r/s in the production of their latest Disney/Pixar film. Many of you know the name Lynn Allen, but in case you have not heard she is now part of the blogging world. Welcome and we are looking forward to seeing/reading all that Lynn has to share. I think the title says it all. Today is a great day to count the many things in life we are all thankful for. Myself this year has brought forth growth in many areas from work to my personal life and I am thankful for each and everyone who has been apart of this great ride. If you are using Viz Render and/or Viz and adding your watermark using a graphics manipulation program (Photoshop, etc..) you may not be aware that these programs offer a way to add your watermark without the need for post-processing. 2. Once here choose the "Load..." button and browse to the image you wish to use as your watermark (choose from one of 18 file types). Render - When turned on, renders the watermark image in your rendered image or animation. A watermark image must be loaded before it can be rendered. Default=on. Load - Enables you to select an image to use as a watermark. Blend value - Blends the watermark image with the rendered image. Values between 0 and 1 determine the opacity of the watermark placed in the rendered image or animation. Image Top - Specifies the placement of the watermark image. The Image Top spinner enables you to determine the uppermost pixel in your rendered image or animation at which the watermark image will be rendered. Image Left - Specifies the placement of the watermark image. The Image Left spinner enables you to determine the leftmost pixel in your rendered image or animation at which the watermark image will be rendered. For those who may be using Max 6 or higher the watermark feature has been removed. You can of course create your own using Maxscript or download one from here. In particular I have been using this one from Bobo. The various blending mode options are a nice bonus too! Insiders Tip: For those attending Autodesk University there will be a rendering contest sponsored by Avatech Solutions. Avatech will invite participants to join in on a fun, interactive event - Avatech's Daily Rendering Contest during Autodesk University, Nov. 30 - Dec. 3, 2004 at MGM Grand Conference Center. Designers, engineers and architects who want to strut their stuff can participate in the contest at the Avatech Booth #800. Four laptop workstations will be set up with Architectural, Civil or Mechanical models. Each participant has 20 minutes to complete an already created model. Basic models and a set of materials that they can pick from to place on the model are already included. 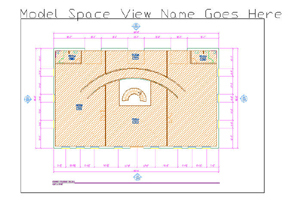 They can use Viz Render with ADT or Civil 3D, Inventor, Revit or Viz to produce the renderings. Then they set up the lighting and camera and at the end of the 20 minutes they must stop the rendering process. At the most, there will be about 4 renderings created each ½ hour of the show. Participants must fill out a submission form. Judges, who are instructors at the conference that specialize in visualization, will view the renderings each day and determine the daily winners. Each set of winners will be posted on the plasma screen the following day. First of all, each participant gets a T-Shirt. Avatech will give away 1st, 2nd and 3rd prizes daily, for a total of 9 prizes. Daily 1st place winners will receive MP3 players. Participants should simply come to the Avatech booth and get rendering! Like many others in a few short days we are headed to Vegas for AU. I am looking foward to seeing many old friends, not to mention Lee, Robin, Shaan, Chris and a few other bloggers while there too. We will each be blogging about this event and sharing different tidbits for those of you who are unable to attend. There will be an ADT 2004 link in the photography section of the sidebar that I will be updating daily. The "will render for food... " group (Shannon, Dylan and I) will be arriving and staying from Saturday to Saturday at the MGM Grand. For fun we recently got a few shirts printed up for AU that says "will render for food..." if you see this shirt feel free to come up and say hello. For those looking to learn more about Viz Render your wait is over. The book Mastering Viz Render by James Smell and Paul Aubin is now available. There are a few sample items available for you to download and review; including a great water example tutorial (and cool night scene). While you are browsing the site be sure to look at the appendix information as there are some great goodies hidden here. Also if you plan to be at AU Jim and Paul are co-teaching a Viz Render class as well as signing books at the Authors table on Tuesday evening. One of the nice things about being in the consulting world fulltime is that your hardware/software needs to be up to date. I mention this because I have transitioned from the HP to a Dell Latitude D800. With changes in hardware like this I tend to evaluate what software to install to keep the machine running lean and myself productive. Here are my favorite Top 10 computing utilities. 1. Microsoft XML Notepad - If you are looking for a great low cost solution for editing .xml files and keeping them well structured then look no further. 3. JAlbum - I mentioned this program before and still find it a great asset in my graphic work. From photoalbums to FTP publishing and more. 4. NewzCrawler $24.95 - As you may know from my past blogging I love RSS feeds and this is a great way to access and organize them. 5a. Webcam32 $39.95 - This is a nice utility that not only can be used for still webcam images but also video push/pull via website or ftp. There is quite a bit that this software can do beyond that as well. 5b. ScreenCam - This is what I use to show screen captures on the blog window periodically of what I am working on. It has a great ftp upload feature and can be set on a timer and more. 6. Network Stumbler - If you work with wi-fi a good detector is invaluable. This is also great for sys admins to help find rogue networks. I typically fire this up to find available networks to websurf while traveling. 7. Skype - You have heard of VOIP, here is a name that is catching on. Basically it works like this if you want to call other people on their computers or phones you can use Skype to make calls all over the world (I recently had a conversation with a friend in the UK from the states free of charge). 8b. Camtasia - Great for quickly creating professional-looking videos of your PC desktop activity. Anyone can Record and create a full-motion video tutorial or presentation, in real-time, and publish it in the format of their choice. No multimedia or programming experience necessary! This is great for tutorials or just to simply show someone how a feature works by seeing the exact steps you are taking to perform it. 9. Aquadock - I mentioned this one before but it is still super cool. If you are or know a Macintosh user you may have seen the Apple Docker. Here is a similar version but brought to the PC world. This one always makes people jaws drop when they see it in action the first time. 11a. Desktop Sidebar - Much like the Konfabulator above this can be almost anything, but within the confines of a single bar. If you have seen longhorn you may recognize the concept. Though I have not been using this as long as the one below I have found it to be a good replacement as my personal favorite has been slowly progressing. 11b. SmartBar XP - Similar in many respects to the one above this has been my favorite for the past 6 months, but sadly development has slowed to a snails pace. The MSN search service beta is now available for those wishing to test this out. I have only been playing with it a short time, but the results are drastically different from those of google (my usual search choice). With all the traveling I have been doing recently it was great to have a full weekend with the family and of course some time for fun! I have been trying to work in a trip to a local indoor go cart track I heard about for some racing fun and we managed to finally make it to American Indoor Carting on Saturday night. If you remember riding go-carts as a child and are looking for a way to race (bump) others, this is about the closest most of us will get to Nascar. Since it was so much fun we are headed back this tuesday evening if you are interested in joining us on the track. I have been working with the new release of Max 7 for the past two weeks. Though a majority of my work is architectural I have been sketching some characters over the past year in more detail and could never justify purchasing Character Studio, good news is that (as mentioned here) it is now included as part of the suite of tools inside of Max. Blur Studio's CG Cinematic for Relic's "Warhammer"
Blizzard Entertainment's CG Cinematic for "World of Warcraft"
As you know I work with Linux a bit here and there and ran across a beta for Linux that may interest those who are looking to use the power of cad on a Linux platform. Currently it looks like the supported flavors of Linux include Red Had, Suse and Java Desktop, downside is it currently only looks to work with Wine at this time. My plate is full the next few weeks, but I hope to get to this soon. Back after a short hiatus these past two weeks and I hope your halloween was as much fun as ours. Called the SCOPO, this prototype compact wearable display is designed for users who need to perform multiple tasks simultaneously. Users have full visual range once they take their eyes off the display, which is positioned in front, slightly below eye level so as not to obstruct normal vision. There is an accompanying video (requires Real Player) and rumored to be $400. It's official and shipping now. What is it? Well Max 7 of course... You can read the press release about it here. One of the most often overlooked items when working with digital files is your choice and implementation of a File Naming scheme. Early in my career I was not so concerned with this, but overtime as I began working on larger and more complex projects the use of a good file naming system has made my life (and others working with me) much easier. Why is this so important and why should you care? Good question. One of the most important reasons to consider the naming structure you use is to benefit both yourself and others later to access a particular file/folder to retrieve or use the data contained therein. Notice to proceed with work is given and off you go to start modeling. Along the way you will want to save this file. Now is the critical time and if you have no standard you should give some thought to your naming scheme at this point. If like most users you probably have a folder for your current job. Some may have a specific folder structure they tend to use from job to job. If so this is a great idea as this will help you know where to look for a particular file regardless of which job you are currently working on. Consistency here is the key and an item you should strive for. Using a similar structure allows us to keep all jobs in a consistent location (this applies for 1-2 users as well as larger working teams). Achieving a good naming scheme starts with the folder structure you use. It is important that the structure you choose/use allow for maximum flexibility not just for current projects but also future work/project types. As you can tell in the example above I tend to use the underscore (_) instead of using periods (.) in my naming strategy. While macintonsh, unix, linux, etc.. work well with periods if your workflow involves multiple platforms you will want to avoid periods to be as compatible as possible with each system. You would be wise to also avoid the use of spaces to separate your naming acronym as this will help when using scripts. 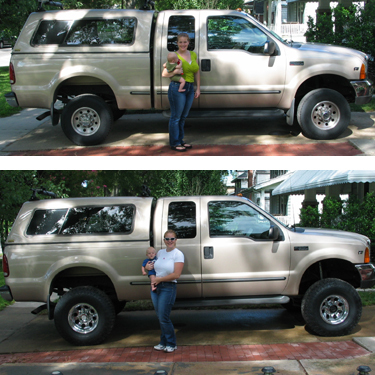 In part II of this article I will be giving more specific examples to help share this concept. In the meantime with a small bit of planning before and during your next project you can help to make your projects easier to work with for everyone involved by paying attention to your specific naming scheme. 1. Under View>>Named Views... you can select your named view and choose Edit Boundaries. This will allow you to specify a new rectangular boundary if you wish. 2. In the Project Navigator you can double click the named view to show the boundary (and the extents of the boundary) on your screen. 3. Use the undocumented command "showmodelspaceviews" to show all the named views in your drawing including their name (see example below). When attempting to save or create an AVI file from Autodesk VIZ, you receive an error indicating the program must be shutdown. This update fixes the save to AVI file format feature for Autodesk VIZ 2005 English. The English update can also be applied to localized installs of Autodesk VIZ, but the AVI specific dialogs will appear in English. To install, download (here) and unzip avi.bmi to the \Autodesk Viz 2005\stdplugs folder. For those interested there is a great regional learning and networking event called AUGI CAD Camp, which will take place in Jacksonville, Florida on November 9, 2004. AUGI CAD Camp is a one-day event that will provide a unique opportunity for you to highlight and promote your particular user group and recruit new members. For you and other members of your staff, the educational benefits of attending AUGI CAD Camp are significant. Choose from among three different classes in five sessions. This enables you and other members of your staff to plan their training strategies and target specific learning needs. Get expert advice from Lynn Allen, Autodesk technical evangelist and friend to end users everywhere. Check out hot new technology from some of Autodesk’s top third-party software development partners in the exhibit area. Have plenty of time to network with peers and colleagues. A single day devoted solely to training and networking is sure to benefit you and every member of your staff, so be sure and spread the word. We hope you’ll join us in Jacksonville! Simply visit our website at http://www.cadcamp.com to learn more. While you are there, be sure to register as slots are filling up fast! If you have any questions, contact Richard Binning. For those who visit and use the discussion groups from Autodesk, they will be consolidating the VIZ release specific + Wishes discussion groups into one master discussion group on October 07, 2004. Autodesk VIZ Vizions will remain. The new forum will be named: Autodesk VIZ (nntp:/autodesk.viz). If you are using NNTP (newsreader) you will need to resubscribe to the new forum in order to use. The development of Autodesk Architectural Studio appears to be discontinued according to this post by Jim Flanigan (project manager for the AAS development team). Having used this product for some time it is sad to see this go, it had the makings of a great prouduct. Looks like SketchUp is about to get a few more users. Steven mentioned Skype to me a few days ago and since then I have seen this linked from a few sites. I have an account I would like to test, if you are interested send me an e-mail and we can arrange the details to connect. I spent a bit more time researching online and getting feedback from a few users who use(d) this product (thanks again). Armed with this information I decided to purchase the software I was considering and did come comparison on-line pricing. On the off chance I headed off to my local tech shop to make a purchase. After browsing the store for a bit I managed to find two in-store locations that had the same product (one in a showcase, the other on a shelf) with different prices. The base price was the same as I could find on-line, the other $10 cheaper. Well I had a trip with my Grandfather to take over the weekend and this came in handy to learn the ins/outs of using the software. My first impression is the software interface could use a bit of updating but I do like the features and ease of use. Right now I have the USB connection verison, but may upgrade to the Bluetooth version to get rid of the wires. 1. I live 21.76 miles from my favorite spot at the Oceanfront. I have been doing quite a bit of traveling and consulting over the last few months and I am looking to add a Streets and Trips type of software to my mobile toolset. In looking at some of the options available; the affordability of GPS integration has caught my eye. Are you happy with the product? Would you prefer a different GPS Receiver? 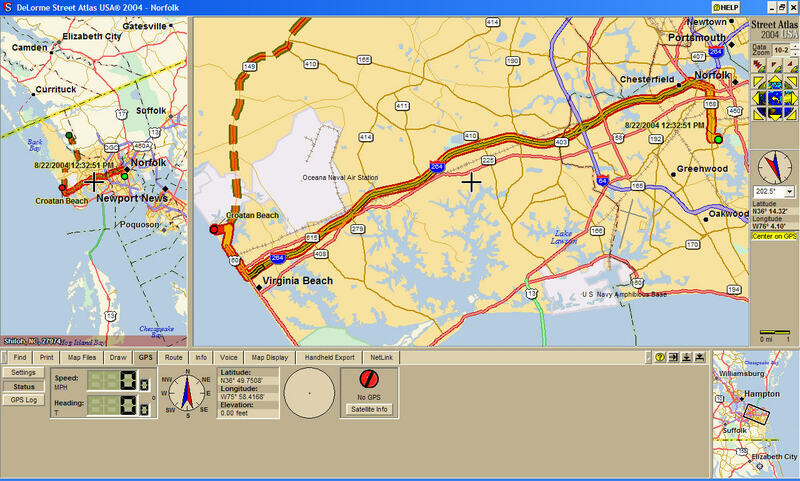 Are you satisified with the Street Atlas USA 2005 software? Drop me an e-mail or use the comment option below. Thank you and I will keep you posted on which option I go with. Checking my inbox this morning I found an interesting link for Architects/Consultants and another for Clients to use as a checklist/review for presentations. EVAUG meeting: August 19, 2004, at Hanbury Evans Wright Vlattas + Company (HEWV) Architectural Firm's "Knowledge Cafe", located at 120 Atlantic Street, in Norfolk, Va. between Waterside and MacArthur Mall. 7:00-7:30pm - Topic #1 - Architectural Desktop 2004/2005 Project Browser/Navigator - Have you ever wondered how to get started with the Project Navigator for new or more importantly existing projects. We will walk through an example of converting an existing legacy project to use the feature and toolset available within the project navigator as well as understand what Constructs, Elements, Views and Sheets really are. 7:45-8:30pm - Topic #2 - Building Systems - Part 2 of a 3 part series - The MvPart Builder Unleashed - A presentation detailing the steps of creating and editing custom equipment and parts. You know cad is a lot like onions, they both have layers. OK so I am no Lynn Allen, but fresh from a cruise and not missing a beat she was at the Design Expo today and had numerous great tips to share with the attendees. What a great event to learn some helpful tips and get to meet so many talented people. Thanks to Pete for snapping this shot. Autodesk Design Expo - August 10, 2004. Currently we have a table setup courtesy of Inlet Technologies. If you plan to be there keep an eye out for us and come say hello. "Given the wide range of opinions expressed on this newsgroup about ADT, I thought it might be useful for someone who was intimately involved in the project to give a "Philosophical Brain Dump" of what we have attempted to do with version 1 and why. Please don't view this as an "official" Autodesk statement or as any kind of effort to avoid the heat that is being leveled against ADT in its initial release. It is merely an effort to increase the understanding of where things are at the present and to help you make your evaluations with a little more information... that I'm sure wasn't included in the manuals :-)"
These are great collections of information and I highly recommend reading through them for a deeper understanding of ADT. In the past the brain dumps have been housed in a few different locations (Chris Yanchar, Rob Starz and myself) to ensure these items were available to the general public and not lost in the shuffle. Well now thanks to Chris (Between the Walls) the entire collection is now available here. It is nice to see these housed in one central location. 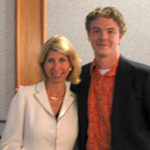 Funny side note: Before I met Chris personally at AU a few years back I knew his name from the Brain Dumps he hosted on his personal website. After our short introduction to each other my first comment was "Hey your the brain dumps guy...". ;) Ok well may be it is funnier to me, but many thanks to Chris for being so helpful to fellow ADT users and helping to make this a better product. Most people in the visualization industry tend to use some kind of graphics manipulation program (Photoshop, Painter, Gimp, etc...) for numerous tasks. Myself I tend to use Photoshop as my choice of software, if like me you find yourself wishing for a larger selection of brushes why not create your own? Lack of knowledge? experience? no more here is a good tutorial, from Rickard Johansson hosted by 3DTotal, explaining how to create custom brushes that should get you started. Here is a good tip from Miker the Biker regarding disappearing cameras in VIZ. For those of you learning to use the ADT Project Navigator (strongly encouraged) one of the first things you may notice is that upon installation of ADT you probably have older projects that still need work to be completed (often referred to as legacy projects). Well no need to give up on the ADT PN just yet, depending on how far along you are in the project you can still make use of the PN. Before we go any further for any drawings created with ADT and the PN you will have a corresponding .xml file created (visible using windows explorer); do not delete any of the .xml files. Create a new project using the Project Browser and set it current. If you open each file individually, you have the option in the PN to right click the construct and/or element category and choose the "Save Current Dwg as _" option. This will save a copy of the drawing to the project location in either the Construct or Element folder, depending upon which was chosen. The method above works well, but is time consuming. Let's look at one of my personal favorites and use Windows Explorer to help make this a more streamlined process. 1. If you drag the file from WE into the PN and release this will move the file to this location. 2. If you use the Ctrl key and drag the file from WE into the PN and release this will create a copy of the file in this location as a construct or element depending upon where you release it. In all three methods above you have the option of changing the name and description for the file(s), if this is a construct you also get the option of choosing which Level and Division you wish for this to correspond with. One additional tip; when using windows explorer you can drag an entire directory to the PN and it will create a new category with the files converted to either a Construct or Element depending upon which was selected. From experience make sure your files are not read-only. For those who would like to use the PN but find legacy projects hindering that effort, this may help to get you started. Though I have not used Rhino for any production work, I do tend to use Brazil quite often. For those of you out there who dabble with programming or would like to check out the Visual Studio 2005 Express Beta from the Microsoft Labs. This is a lightweight version of Visual Studio and includes a smaller limited toolset. Includes, Visual Basic, Visual C#, Visual C++, Visual J#, Visual Web Dev and SQL Server examples. Over the last 2 months I have found myself programming less and less and have not had the chance to play with this in conjunction with any of the Autodesk products. If you have been using/testing them together (either successfully or not) drop me an e-mail, I would be curious about your experiences. As you may have heard from Autodesk, Shaan, Lee, Robin and a few others; AU 2004 is scheduled to take place from November 30 – December 03, 2004 and the ADN/ATC portion of the conference will be held on November 29, 2004. For subscription members you should have received an e-mail from Autodesk last week for early sign-up. Why early sign-up? There are several labs that are offered (hands-on computer training) that fill up fast, so if you have not signed up yet be sure to do so soon. AU is a great learning and networking event as you get some of the most knowledgeable speakers/presenters in the industry. I have attended the past two years and the level of knowledge and people you get to meet/interact with is incredible! Lee has some great links including maps of the MGM Grand and more available here and here. We will be there again this year and are looking forward seeing new and old friends. If you plan to be there or have any great stories from AU send me an e-mail. Well the boys and girls over at Maxunderground have a press release from Discreet that shares some information about the upcoming release of 3DS Max 7 (shipping this fall). There are a few interesting features that should be of benefit to quite a few users. The desktop screen capture in the sidebar is courtesy of a fun free utility I have been playing with called SCWebcam. Think of this as a combination of Snag-it and a webcam but for your computer desktop. Capture can run in several reduced priority modes to minimize the impact to your system - good for games! Built-in WWW server - serve your desktop or even a small web page right from your own PC! Full scripting system allows complete flexibility over the image processing and upload steps. Several sample scripts are provided for those not interested in writing their own. 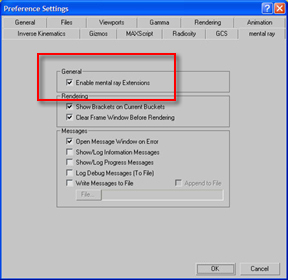 This is a quick tip for those who wish to use Mental Ray materials in VIZ 2005. 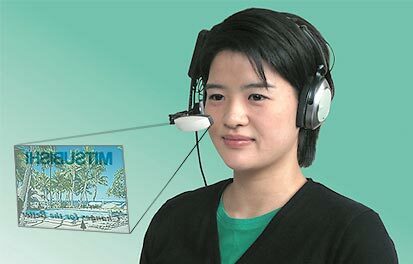 In order to take advantage of using the Mental Ray materials from the browswer you must enable the mental ray extension (off by default). And for your blister care try the following link. Do you use acad blocks? Do you use the same blocks in multiple drawings? Ever need to update the blocks? 1. The ability to have a block in a drawing and manipulate the block(s) by redefining/changing all instances can be done with the refedit command, or by recreating the block and using the same block name. This will update all the blocks in the current drawing of the same name. 2. If you are defining your linework for an object to become a block in an external file you can use the "insert" command with the browse option to choose the external file to override blocks in your drawing of the same name. If this is not working the most likely issue is that the file was wblocked out as a block to a file of the same name. If so explode the block in the external file to simple linework and purge the block from this drawing and save the file. The insert command>>browse option will now insert the file as desired. 3. If you are wblocking information out to an external file or block library as blocks and not linework you can use DesignCenter (Ctrl + 2) to redefine blocks in your drawing. To accomplish this open DesignCenter and browse using the folder tab to the file and expand the sub-files and select the blocks option. Nowright click the block you wish to redefine in your current file and choose "Redefine only" to update the block definition. You can use the "Ctrl + Tab" and/or "Ctrl + Shift + Tab" key combinations to cycle through open drawings and repeat as needed. 4. Of course for those of you who would rather type, script or use lisp you can still use the alternative -insert with the = option (-insert , ExistingBlockname=path of drawing and FileName, choose "yes" to redefine the existing blocks in the drawing). Example -insert, MyBlock=C:\WorkingFiles\MyBlock.dwg which will replace all instances of the block "MyBlock" with the information from the drawing "MyBlock.dwg". This is very similar to Step 2 above and has the same limitations of requiring linework only in this file. *5. Of course you could always use a small bit of lisp code to swap one block out for another, courtesy of David. This should help you to understand a few of the many ways to use blocks more effectively in AutoCAD. The Eastern Virginia AutoCAD Users Group next meeting will be July 14, 2004. 7:00-7:30pm - Topic #1 - AutoCAD 2004/2005 - Tool Palettes- You may have seen this at the demo's, or seen others using it but wondered how the tool palettes work and how you can customize and use them to their full potential. If so then this session is for you. Thanks to everyone who supports and attends these meetings, the EVAUG would not continue to grow in its current direction without your active participation. I mentioned many months back a few products I use for time management. With most of the consulting and freelance work I do MS Project would be way overkill as a simple spread sheet would suffice. Behind the scenes I have been using a great product from Safari Software called Masterlist. They are getting ready to release Masterlist Professional and it is in beta right now. If you are interested in testing this product, visit this section of the site. As you have probably noticed by now I have have been updating the look of the blog, more to come over time like all great things. In doing this I have also added a link to the side called "reading" to track my choices and selections in reading material. Speaking of books I received a brown wrapper package from Thomson Distribution Center that contained Illustrated AutoCAD 2005 Quick Reference, unfortunately the package only contained the book and nothing else. I have an older illustrated guide from Ralph(R-12 Dos era) that was/is a great resource and after years of use is tattered and torn, this new one will make a great updated resource. To the individual(s) who sent this, thank you. I mentioned it briefly before but here is a little more indepth information about Animation Mentor. 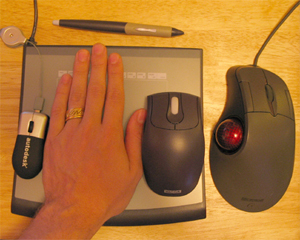 The image below shows a few of the devices I use on a typical basis (Wacom tablet, Microsoft trackball). I threw my hand in there for a scale comparison to show the size of the mini-mouse (tiny device on the left). Well at first I laughed when LC gave it to me, but after his persistance in trying to get me to use it for 2 hours I finally gave in. The first 30 minutes was strange as it is quite small, but after another hour of working I did not notice the size being an issue. Now a week + later I just realized that the only other input devices I have used is my tablet for sketching/graphic touch-up. 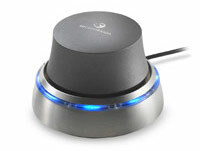 The other cool item about this device is that it has a retractable cord (see the silver item at the top of the picture), this also detaches completely from the mouse for storage/travel too. I checked the Autodesk Store, but cannot find these for sale anywhere. If you have a few and would like to get rid of them or know where I can get more for my LUG, drop me an e-mail. As a quick note for those using ADT 2005 and named views. 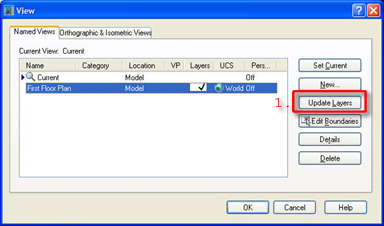 If you create your views early on in your project you may notice that if you edit a named views boundary later that some of the layers will be frozen. To fix this use the "Update Layers" button in the views dialogue box as shown in the figure below. 1. Updating custom Design Center content. Really easy and straighforward. I particulary like the directory and content structure (introduced in 2004) from earlier versions as this makes much more sense. My custom stuff fits perfectly in these modules with only a few additional sub-directories. 2. Migrating existing property set definitions from an older release to work seamlessly with 2005. This is the bulk of the work to ensure that legacy projects migrate seamlessly into the new release. Combining PSD’s with scheduling and classifications make this an incredible way to report/return needed data in many forms. If you are not sure what these are or how they work and would like to see some examples posted here let me know. What a great weekend... Besides cleaning up the studio and rearranging the space layout, we managed to take an early morning walk with Dylan and our pup along the oceanfront. This afternoon/evening gave me a bit more time to take care of a few computing related needs. All the items I have been working on this evening (web page development, documents, spreadsheets, newsgroups, web surfing, instant messaging, etc...) have all been possible through Linux. Finally got around to setting up my e-mail using Evolution too... Still have lots more to learn but Linux Online is a great resource as well as the Linux Documentation Project. Animation Meat! - a great site for understanding traditional animation with a large number of notes and more from professional animators and studios. Animation World Network - This is a great resource to find out what is going on in the animation industry. Pixel Corps - Great information, classes and more. This site covers a broad range of digital media. Animation Mentor - while not fully released yet this looks like a promising site to stay tuned for. Sign up on the site to be notified when the mentoring goes live. Pluginz - Digital tools for digital artists. This is a great resource if you are looking for third party plug-ins and more. And of course if you are a Viz user be sure to check out Vizdepot for free tutorials, forums and more. Also be sure to check out the recent banners and links Steven posted too.